This is the second block of the 2016 Quilt Extravaganza ! In this BOM, we will create a Be My Valentine block using the Carefree Curves template. Don’t worry; we will not set in any curved seams. Select fabrics to create the strata for this 2016 Block of the Month Use as many scraps from your stash as possible. Nancy used bright and neutral fabrics in this color-value-based quilt. All blocks for 2016 were created from pieced fabric strata. Find larger strata scraps leftover from last month’s block. Use the Carefree Curves Template. Position the template on the wrong side of the strata. Trace the third largest size arc and wedge point onto bright and neutral strata with a pen. Position and trace the second smallest curve on the wrong side of both bright and neutral strata. We used some of the leftover areas of the startas from last month’s block. Cut each wedge shape along the angled lines. Do not cut curve. Apply SofShape Fusible Interfacing to the wrong side of each larger and small neutral wedges. This will make the lighter fabrics opaque when appliquéd to bright backgrounds. Cut a 2-1/2″ crosswise strip of interfacing for the smaller size and cut a 3″ crosswise strip for the larger size. Meet right side of strata to smooth side of interfacing. Pin. Stitch directly on curved traced lines. Trim away excess fabric. For best results, use a pinking shears or pinking rotary cutter blade. Trim away excess interior interfacing with a scissors, leaving about 1″ of interfacing. Turn interfacing to wrong side using Clover’s Point 2 Point Turner. Cut one block 12-7/8″ from each: bright strata and neutral strata. Use rotary cutting tools to cut each strata square in half diagonally. Working with one bright triangle and one neutral triangle, position a wedge at each triangle point. Pin. Save the unused half of each diagonally cut block for a future month’s project. Thread machine with monofilament or clear thread such as Madeira’s Monofilament thread. Machine stitch shapes to background, using a straight stitch, zigzag, or blind hemstitch. Baste the wedge’s cut edges to the background. Match right sides of each bright and neutral triangle. Use a 1/4″ seam allowance to join the halves. Note: This is a bias edge. Sew carefully so the seam doesn’t stretch. Open and press seam allowances open. What Would a Quilt Look Like? Suppose we were to make a quilt using only this one block style, what would it look like? Digital quilts are made using Electric Quilt 8 (EQ8) software. This first digital quilt concept uses the Be My Valentine block as described above, but you’ll see, we took the liberty of making the block with matching appliqué shapes. The first quilt has only neutral applied wedges and the second quilt has bright applied wedges. The second digital concept quilt features the block in a six by eight block grid, framed with traditional sashing and cornerstones. The last digital quilt throws convention out the window. To create motion in this quilt Nancy eliminated sashing and mismatched the heart sizes at each corner. 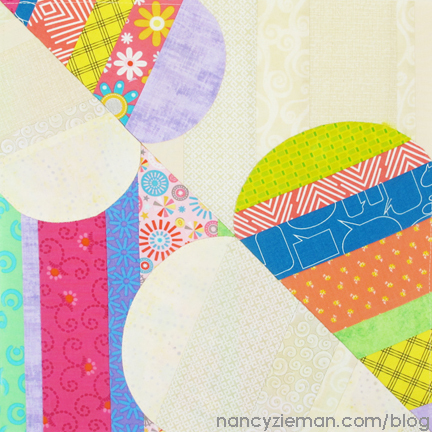 We’ll be using the Carefree Curves Template throughout the entire 2016 Quilt Extravaganza. Watch episodes online for more tips on using the templates in Nancy’s two-part series featuring the Trace’n Create Carefree Curvestools on Sewing With Nancy. 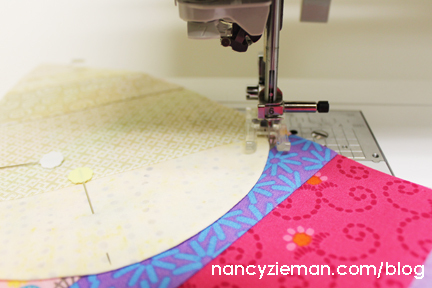 Watch Quilt with Carefree Curves (Part One and Part Two) on The Best of Sewing With Nancy. Very cute. It does look like ice cream cones! such a cute block… I love this BOM! I really like the ice cream come look of the middle quilt. Although I believe it’s supposed to be hearts the ice cream cones stand out to me. I love color so I really like this one best. Sooo pretty.